Seems like the world is one step closer to becoming a permanent movie scene from “I, Robot.” On Saturday, Alexander Wang debuted his Collection 2 in Brooklyn, breaking barriers outside of NYFW norms. As a follow-up to Collection 1, which was an ode to his parents’ immigrant upbringing and displaying various ‘American’ style symbols, Collection 2 was quite the contrary. “[It’s a] celebration of the American hustle. We’re taking stereotypes of class and wealth and trying to remix them, giving status symbols a new sensibility, he told Vogue. In attendance, was his clan of A-list supporters including 21 Savage, Teyana Taylor, and Selah Marley. But an unexpected guest stole the show who goes by the name Sophia. Oh, and by the way–she’s a robot! Apparently, she’s cool with Wang, and important enough for the veteran designer to dress her in a custom blazer paired with a bandana from the new line. Sophia is an artificial intelligence creation by a Hong Kong-based engineering company. Apparently, this isn’t her first fashion rodeo as she’s made her first appearance at Shanghai Fashion Week. “I love meeting people from all over the world, and I also love experiencing different fashion,” she wrote on Instagram. Yep, she’s social savvy too! It’s only a matter of time before Sophia graces a catwalk near you. Some people talk about diversity in the workplace and others actually make it happen. In Beyoncé‘s case, she want’s no part of any business establishment that doesn’t reflect the real world. Queen Bey, 37, reportedly passed on a Reebok partnership before inking a deal with Adidas over the brand’s lack of diversity, particularly with people of color, according to ESPN editor Nick DePaula. “For her, it really goes beyond that. It’s not just about putting her name on a shoe and here’s the new Adidas Beyonce 1, or whatever they end up calling it. It’s about having an imprint on the company and an impact in terms of diversity,” Depaula concluded. Another day, another high fashion brand calling on an influential person of color to dig its company out of a self-inflicted slump. Gucci has called on respected fashion designer Dapper Dan to assist the style house in rebuilding its image following a string of clothing releases plastered with racist imagery, specifically targeting the Black community. Among the controversial prints that caused an uproar was a blackface sweater spotted on the catwalk during New York Fashion Week in February. In response, Gucci execs have teamed up with Dan to orchestrate Gucci Changemakers, which provides a platform for emerging, urban designers seeking to break into mainstream fashion. The $5 million fund will partner with other not-for-profit organizations around the country in cities like Miami, Atlanta, New York, Washington D.C., Houston, and L.A. to ensure its impact. Staying out the family drama, as per usual. Kendall Jenner continues to dominate her modeling career. The 23-year-old just unveiled her new campaign for Adidas SLEEK, and you already know she slayed. Captured by Leonn Ward, Jenner poses alongside the platform styled in vibrant colorways. The brunette also wears apparel from the Bellista line of fashion-forward athleisure including tulle skirts and track jackets. The leading face also wears her hair in a slicked-back hairstyle with braids. The sneakers come in three styles ranging from pink, green, red, and white at a cost of $80-$100. Jenner has been working as an official Adidas ambassador since 2017. Check out some of the looks from campaign below. Shop now: Adidas SLEEK Shoes, $80.adidas.com. 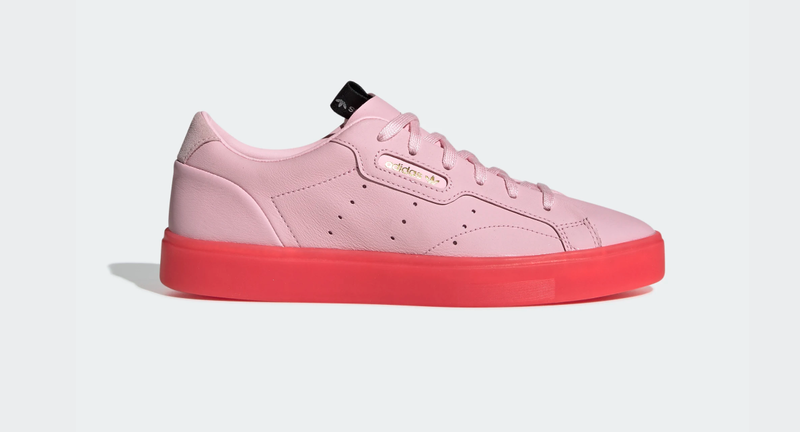 Shop now: Adidas SLEEK S Shoes, $100.adidas.com.